Swedish synthpop is generally known to be fantastic, and Lust For Youth does a great job of continuing this stereotype. While I highly recommend you check out their full length albums (Perfect View and especially International have been on my heavy rotation for a few years now), their newest single is a downtempo number that reminds me of the best Martin Gore-helmed Depeche Mode songs. It’s fitting in perfectly with my leisurely, cat-cuddle filled Saturday morning, so I thought I’d share. Although Molly Nilsson previously collaborated with John Maus and also has a large discography under her belt, I haven’t had the pleasure of hearing her music before today. The above song caught my attention for its macabre/romantic lyrics and minimal melody, and the other tracks I’ve listened to off of various releases are equally as wonderful. I can’t find much information about her, but some articles claim she was born in Sweden and currently lives in Berlin. I’m loving her powerful voice matched with her simple synth anthems. Her ‘These Things Take Time’ release is available on Spotify, and you can listen to/buy her other releases via her official website. In preparation for Veronica Vasicka coming to Vancouver for a DJ gig, I’ve been listening a lot to one of my favourite Minimal Wave compilations, The Hidden Tapes. One track in particular that’s been haunting me has been You Don’t Know My Name by a mysterious artist named Kym Amps. I’ve tried to do some research on Kym Amps to see if I could find out more info about her, and see if she has any other releases. The always awesome Systems of Romance posted the one single that she definitely released, which you can find here. However, trying to find info on her background and any other releases has been a bit tricky. As for minimal wave songs, that single seems to be all she ever released. However, there also appears to be a soprano vocalist with the same name. I’ve listened to a couple of her songs, and while the non-coldwave songs have a much more polished vocal style (not to mention higher notes), I feel like I can hear a similarity. Her photo from the above biography page and the photo on the cover of the minimal wave single also have some interesting similarities. If you happen to know any info about Kym Amps feel free to let me know – is she now happy and thriving in a soprano career? Does she still fondly listen to synthy beep boops and dream of releasing some new material in that vein? I’d love to hear what she’s up to these days. Until then, I’ll give You Don’t Know My Name a listen every so often and enjoy the melancholic charm. Edit: A commenter kindly pointed out that there are two other Kym songs available for purchase on iTunes and streamable on Spotify: I Must Have Been Seeing Things and Days Like These. Her voice is really heavenly and I’ve been loving them! Automelodi is coming to Vancouver! And the year is off to a fantastic start. Event page here! Just heard this song off of the new two-track release from Pleasure Symbols, and it’s mesmerizing! Dark and droning coldwave with some post-punk flavour thrown in, this Brisbane band is definitely going to be on my radar when it comes to future releases. Ultraviolence is the other track on this release and definitely worth a listen; evokes feelings of a descending, shadowy dystopia. 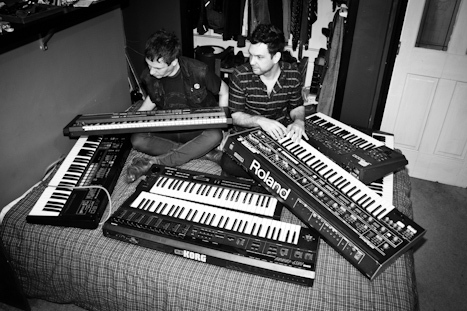 Head on over to their Bandcamp here to check out both excellent songs. 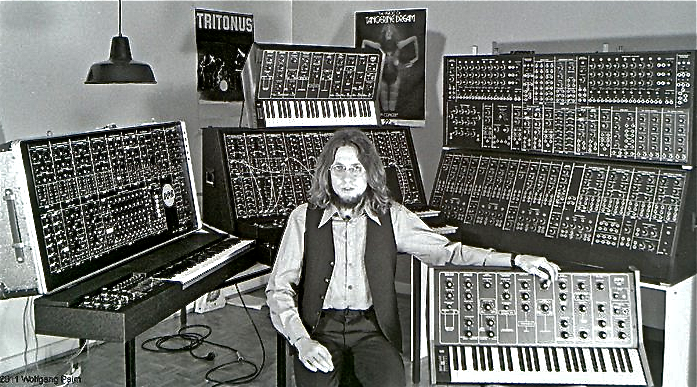 I found this photo on Black Marble’s last.fm page and it got me to thinking about how much I love photos of artists surrounded by lots of synths. It makes me giggle and envious all at once. I’ve seen a ton while checking up on artists that I enjoy, but haven’t been saving them as I go and am having problems finding my favourites now. This guy is having a good day life. 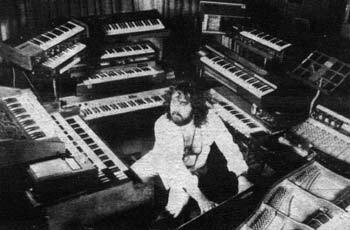 My favourites tend to be with the artist surrounded by all of his/her synths, staring confidentially into the camera. “This is my dowry. If you link your life to mine in a romantic fashion,” (arm sweep) “this can all be yours!” And what better dowry could one ask for, really?